Years of Service Custom Awards. 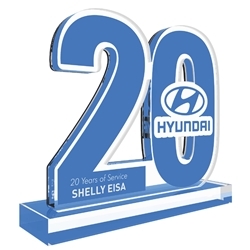 These custom awards help recognize your employees key service milestones. Provide your employees with the recognition that they deserve for all of their hard in yiour organization. TrophyPartner.com can design a service award program for key milestones like 5 years, 10 years, 15 years, 20 years and beyond that incorporates your logo and the the emplopyee's name. Pricing varies based on the whether it is a paperweight style, 2-piece award, plaque, etc. and can range from $25 all the way up $200 or more per piece. We can achieve most budgets by changing the complexity, size and thickness of the award. A minimum order of $400 is required. Prices/sizing can be quoted after a concept is approved. These eye appealing awards make the perfect way to recognize employee dedication. Once we get your information we will put together a free design or two and email that to you with no obligation to purchase. Tweak the design until we have created the perfect award for you. Item Size 5" to 11"